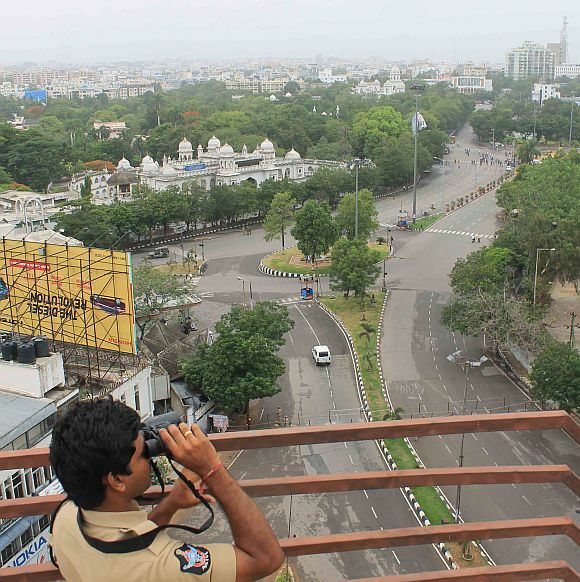 Andhra Pradesh capital Hyderabad on Friday resembled a fortress with 10,000 policemen from the state and 2000 Central paramilitary force personnel deployed in view of the 'Chalo Assembly' protest called by pro-Telangana parties that began this morning. 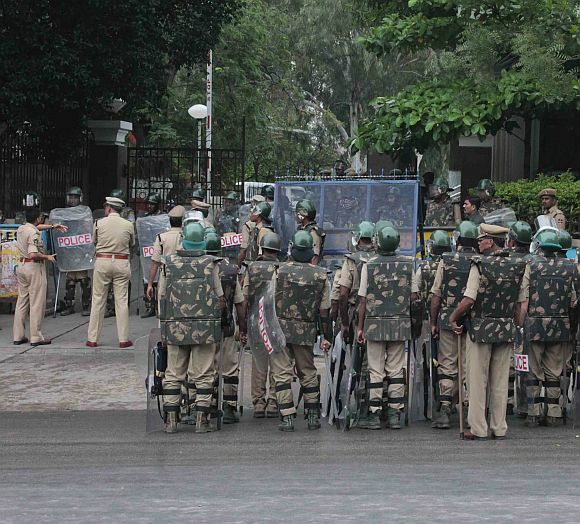 A number of roads leading to the Legislative Assembly in central part of the city have either been closed or traffic diverted. Office-goers and others had a tough time in view of the restrictions. The Andhra Pradesh State Road Transport Corporation (APSRTC) has regulated its services, while the South Central Railway has cancelled or partially cancelled its local trains. A number of educational institutions have declared a holiday. 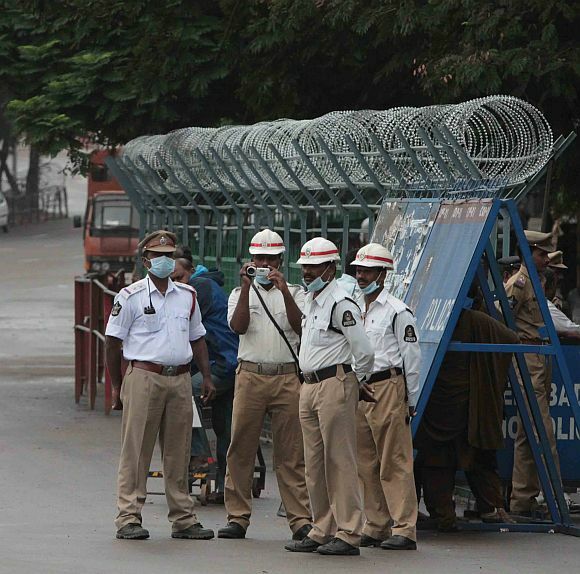 The students of Osmania University sought to march to the Assembly, but they were stopped by the security personnel. Two of the major problems on hand for the state administration is the law and order situation and the participation of the underground Naxal cadre. The central Intelligence Bureau has informed the state administration about the participation of the underground Naxal cadre, who have moved to the state following the incident in Chattisgarh. The Naxals could try and merge into the movement and also attempt to disrupt law and order, the Intelligence report states. The Telangana agitators have, however, rubbished this claim and say that each time the movement gains momentum, the state puts out such false information. The movement is not based on Naxal support. Instead it is a people’s cause, they say. 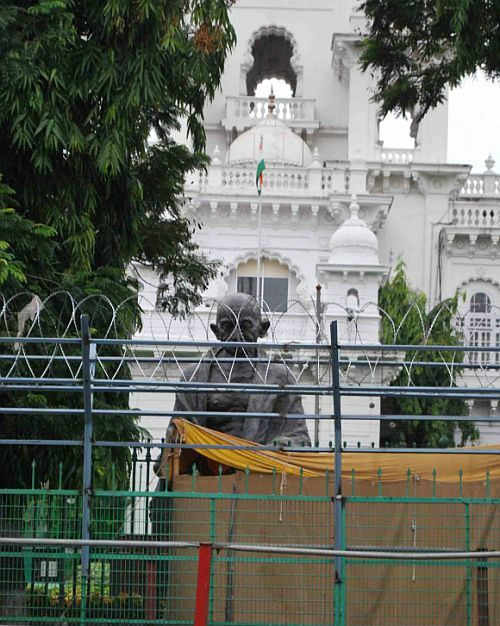 For Chief Minister Kiran Kumar Reddy, it is a herculean task ahead. He has successfully managed to convince the Congress high command to put on hold any decision regarding Telangana until the elections. The high command will be watching closely how Reddy handles the situation and in case things turn bad, then he would have a lot of answering to do. Reddy is today the biggest opponent of the Telangana movement and the manner in which he handles Friday’s situation would have a bearing on his future in the government. If the situation turns bad, he will be under pressure to step down and in case he manages it well, then there would be no problem to his chair until the next elections. A lot of questions have been raised as to why the Telangana Rastriya Samithi decided to go ahead with this movement instead of discussing the same in the assembly. They have not been allowing the assembly to function and despite attempts made by the speaker to break the impasse, the TRS has avoided attending the assembly. They demanded that all other issues should be kept at bay and only the Telangana issue should be discussed. They accuse the government of not giving the Telangana issue any priority. For the TRS, this movement is extremely important. Luckily for them, all activists, including students, have joined hands to take part in this movement. The TRS is aiming to set the stage for a major victory in the next assembly elections in the Telangana region. Telangana activists say that once this programme is complete, then there would be more to follow and this would be supported by the Telangana joint action committee which has decided to step up the heat and ensure a positive announcement on the issue before the next elections.